Medieval battle. Pencil drawing by W.A. Dwiggins (mid-1880s). Courtesy of Special Collections, Boston Public Library. Imprint for The Littlebook Press. From Woman: Why Man Cannot Live without Her—Or with Her. (Boston: The Littlebook Press, 1914). Design by W.A. Dwiggins. 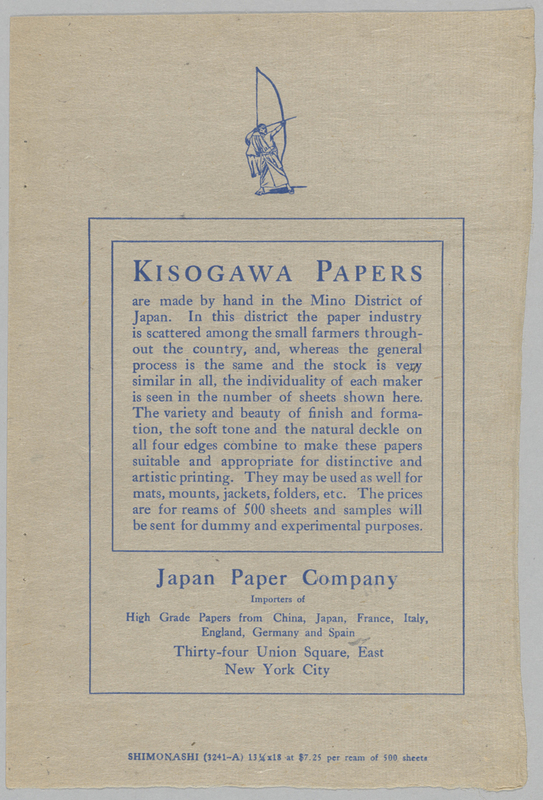 Kisogawa Papers specimen from Japan Paper Co. (c.1915). Illustration probably by W.A. Dwiggins. 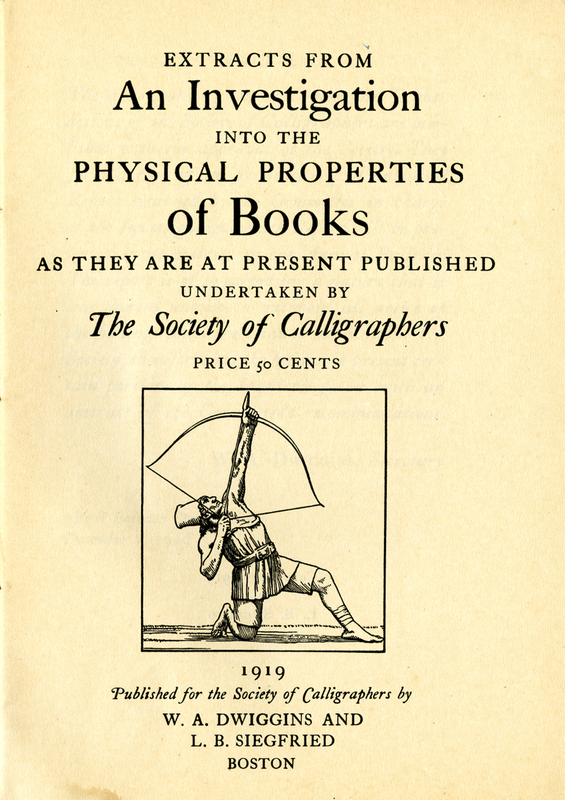 An Investigation into the Physical Properties of Books as They Are at Present Published (Boston: The Society of Calligraphers, 1919). Cover design and illustration by W.A. Dwiggins. Books from W.A. Dwiggins and L.B. Siefgried mailing label (1919). Design and lettering by W.A. Dwiggins. 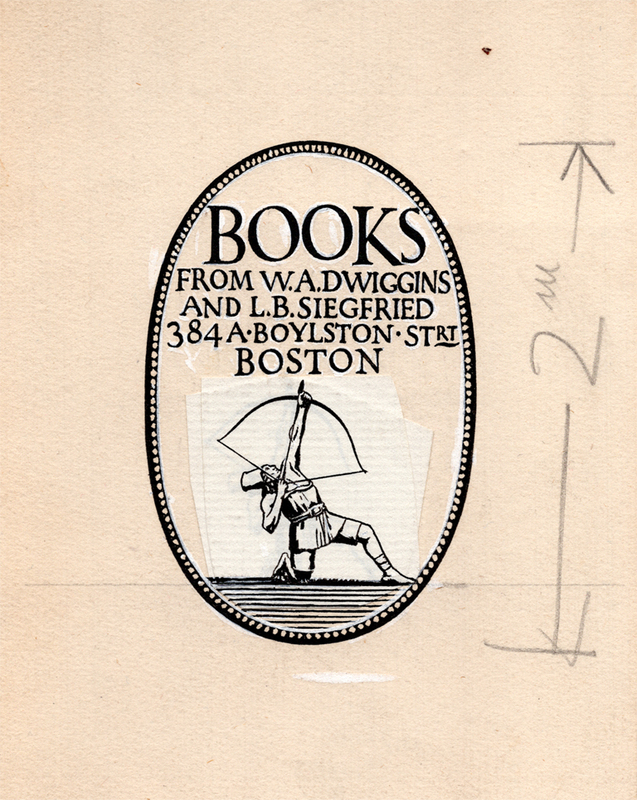 A simplified version of this kneeling archer also appeared on a mailing label used by Dwiggins and Siegfried at that time.The original artwork for the mailing label indicates that Dwiggins revised the drawing of the archer to achieve the proper shooting angle, fitting the arrow tip between S and T of “BOSTON”. Original pen-and-ink artwork with pasted-on correction for Books from W.A. Dwiggins and L.B. Siegfried mailing label. Design by W.A. Dwiggins. Image courtesy of Special Collections, Boston Public Library. Original artwork by W.A. Dwiggins for archer used on cover of Extracts from an Investigation… (1919) revised and reused for title page of Sagittarius: His Book (New York: The Typophiles, 1951). Image courtesy of the Thomas Fisher Rare Book Library, University of Toronto. Another variant of the kneeling archer was used for the cover of The Fabulist no. 3 (Autumn 1921). The stance is the same but the headgear, tunic, belt, and ground have all been changed. 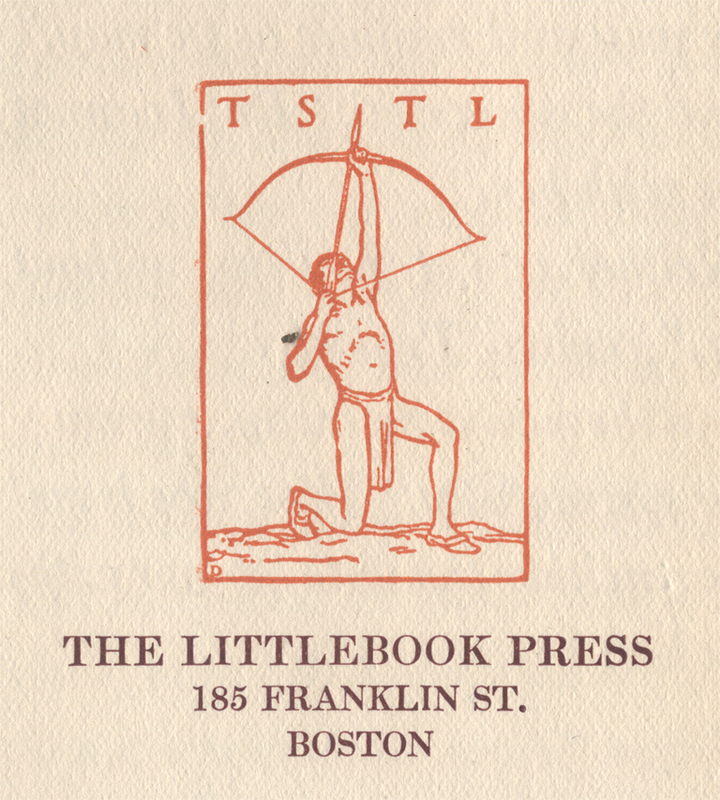 According to Dorothy Abbe, this archer was placed on the cover to indicate that, “The sky’s the limit.”  This is the same sentiment that previously appeared as the acronym TSTL with the archer imprint for The Littlebook Press. It symbolized Dwiggins’ optimism about his creative potential at a point when he had begun to look for a way out of advertising design and into book design. 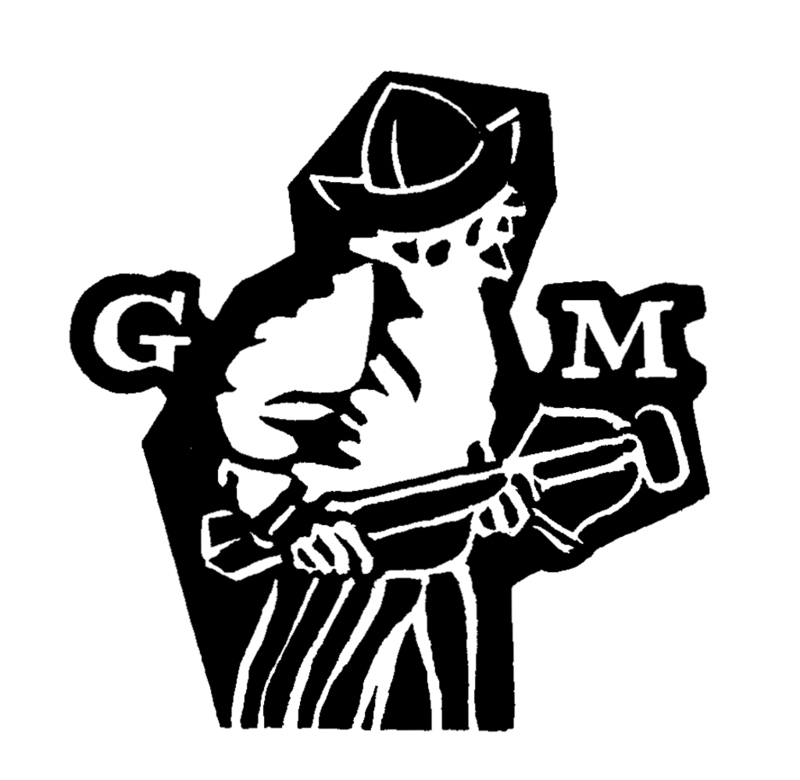 In this respect, the grand ambitions represented by the archer marked a significant shift from “the digger” symbol that Dwiggins had employed on his stationery from late 1907 until 1914. The motto that accompanied the digger (a man with a spade)— “Il faut cultiver nostre jardin” from Candide (1759) by Voltaire—was inward-looking as befitted Dwiggins’ quiet nature. 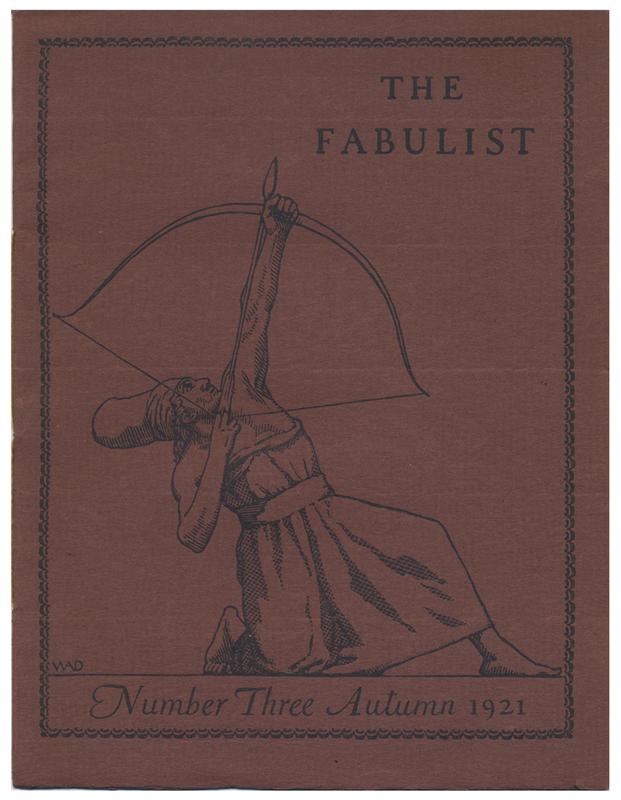 Cover of The Fabulist no. 3 (Autumn 1921). Design, illustration, and lettering by W.A. Dwiggins. 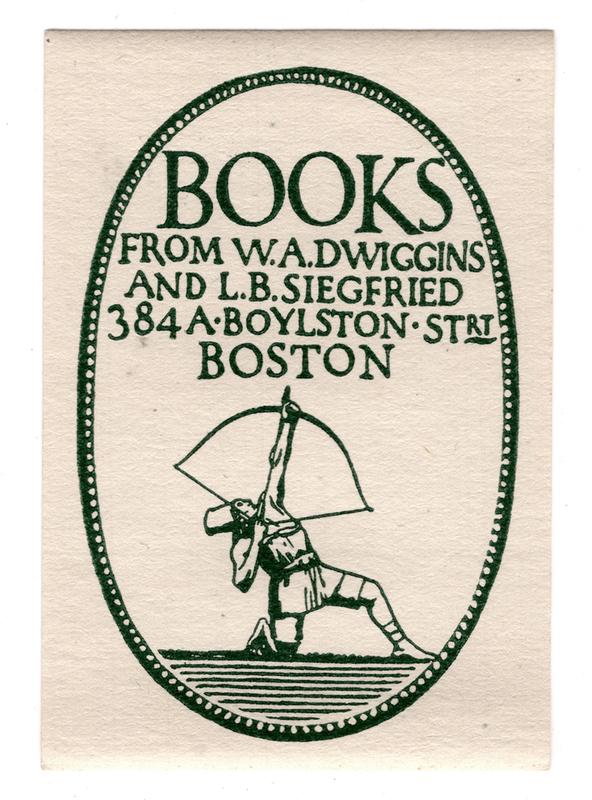 A second archer was used by Dwiggins and Siegfried for a “publishers’ compliments” card that accompanied Extracts from an Investigation into the Physical Properties of Books as They Are at Present Published. This time the archer (now bearded) was no longer in the act of shooting an arrow, but had already completed the shot (presumably successfully) and was now taking a well-earned bow. 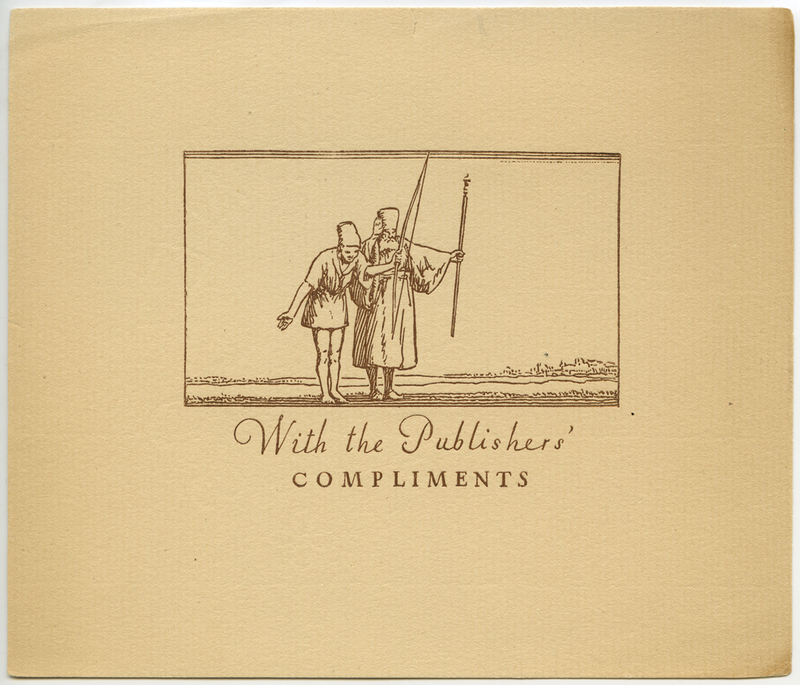 Publishers’ compliments card accompanying Extracts from an Investigation… (1919). Design, illustration, and lettering by W.A. Dwiggins. 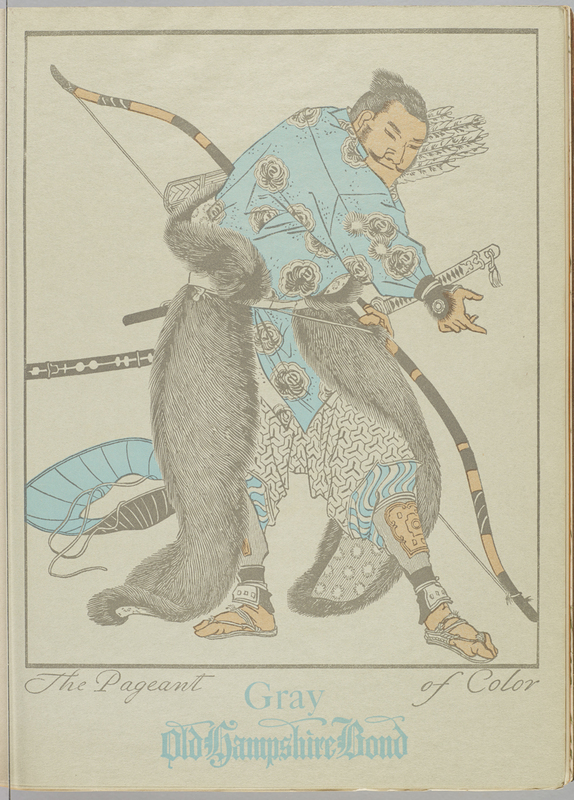 The archer appears in Japanese form twice as part of the gray paper entry in The Pageant of Color series of inserts from Hampshire Paper in the early 1920s. 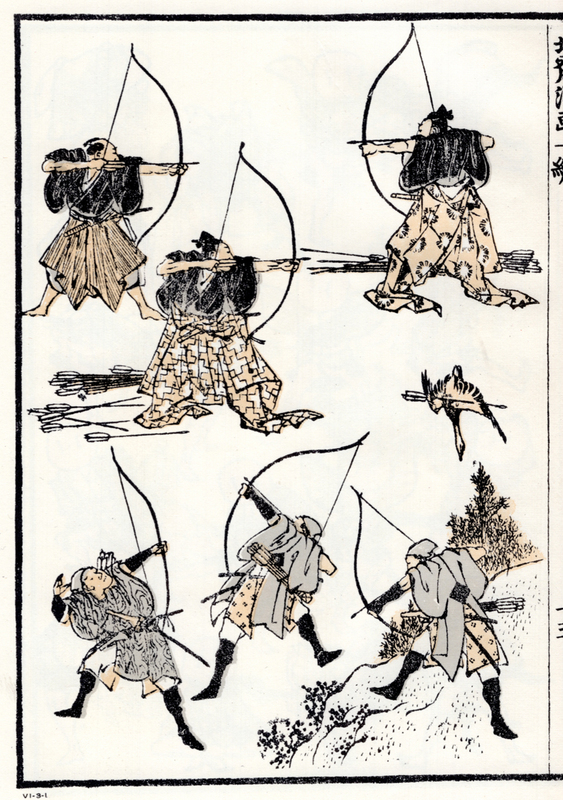 The front has an archer in a very detailed Ukiyo-e woodcut style while the reverse has a smaller archer in a sketchier Hokusai manner. Some possible sources for Dwiggins’ Old Hampshire Bond illustrations are shown following them. 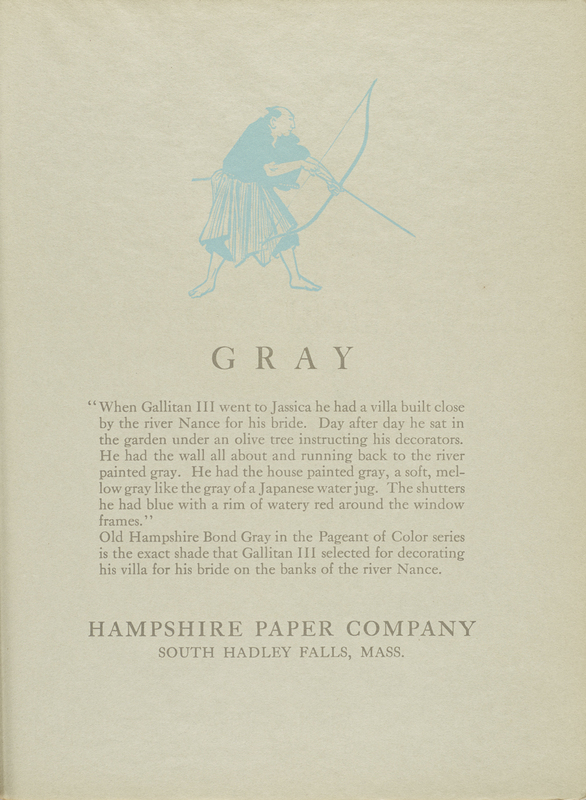 The Pageant of Color: Gray. Old Hampshire Bond (Hampshire Paper Co., 1923). Illustration, lettering and design by W.A. Dwiggins. The Pageant of Color: Gray. Old Hampshire Bond reverse (Hampshire Paper Co., 1923). Typography and illustration by W.A. Dwiggins. 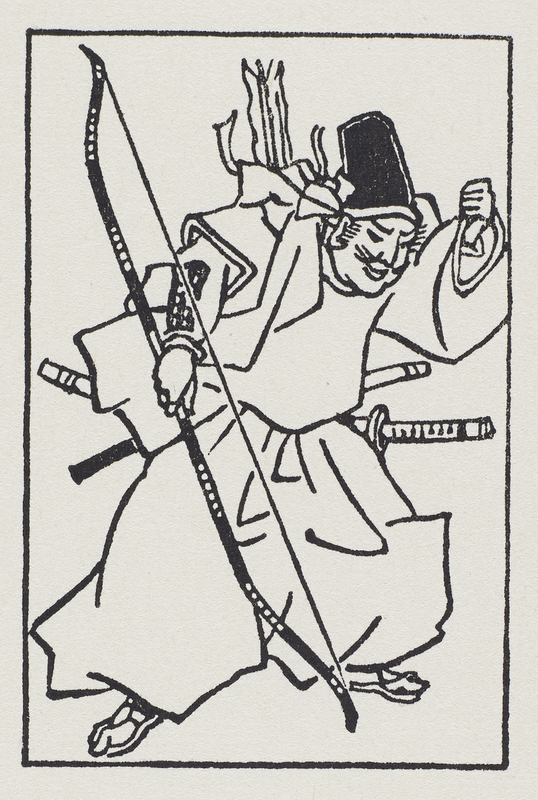 From Japanese Warrior Prints 1646–1905 by James King and Yuriko Iwakiri (Leiden and Boston: Hotei Publishing, 2007). Cartouche from Old Hampshire Bond “The Pageant of Color: Azure” (Hampshire Paper Co.) insert in Direct Advertising vol. XI, no. 1 (1925). Illustration by W.A. Dwiggins. 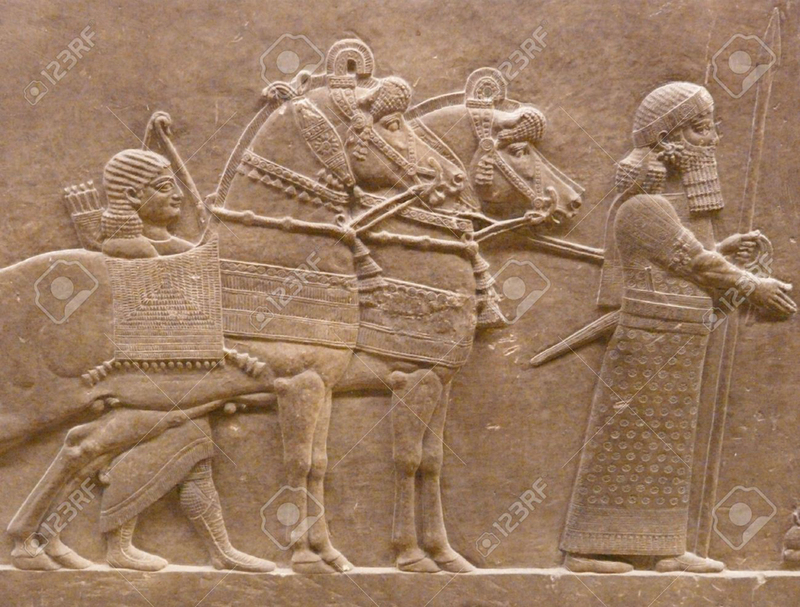 Ancient Assyrian wall carving of horses and men. From 123RTF stock photo website. Original source uncredited but likely the British Museum. At nearly the same time that he was creating the Assyrian cartouche for Hampshire Paper Co., Dwiggins was working on the first of twelve monthly calendar designs for The Marchbanks Press in New York. For some odd reason, he made a kneeling crossbowman the focus of the February mailer rather than either the November or December ones when Sagittarius (the archer) is ascendant. Perhaps the crossbowman is hunting a snowshoe hare. The Marchbanks Calendar for February 1925. Illustration by W.A. Dwiggins, typography and printing by The Marchbanks Press. Image from private collection of Charles Nix. Tailpiece no. 3 from Harpers Magazine (January 1926, p. 256). Design by W.A. Dwiggins. The Travels of Marco Polo (Rochester, New York: The Printing House of Leo Hart, 1933) is one of Dwiggins’ most complex and satisfying books. It is full of marginal illustrations, among them three involving archers (pp. 72, 112 and 310). The first of these is another kneeling archer, but instead of aiming his arrow he is in the preparing to nock the arrow. 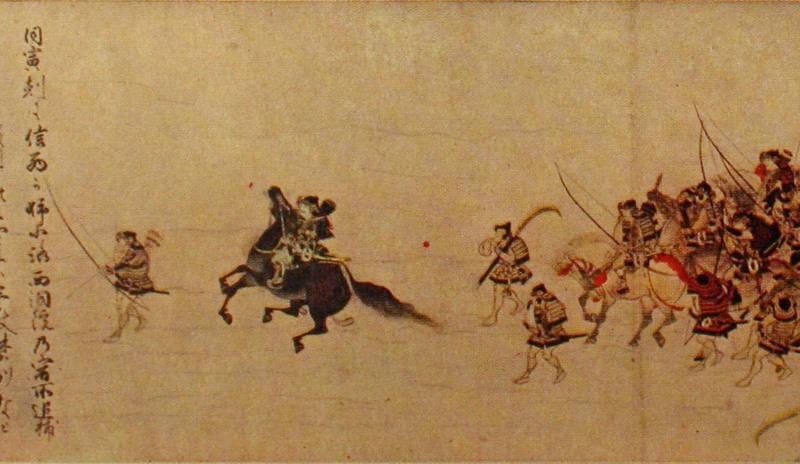 The second archer, riding a galloping horse, is aiming his bow and arrow behind him. The third is holding his bow in his left hand and gesticulating with his right. These are three very different archers, both stylistically and in terms of their actions. Through them Dwiggins is able to indicate to the reader the scope of Marco Polo’s travels among various civilizations of the Far East. I have not been able to identify Dwiggins’ sources for any of the three archers even though it is very clear that he based at least the latter two on existing illustrations. 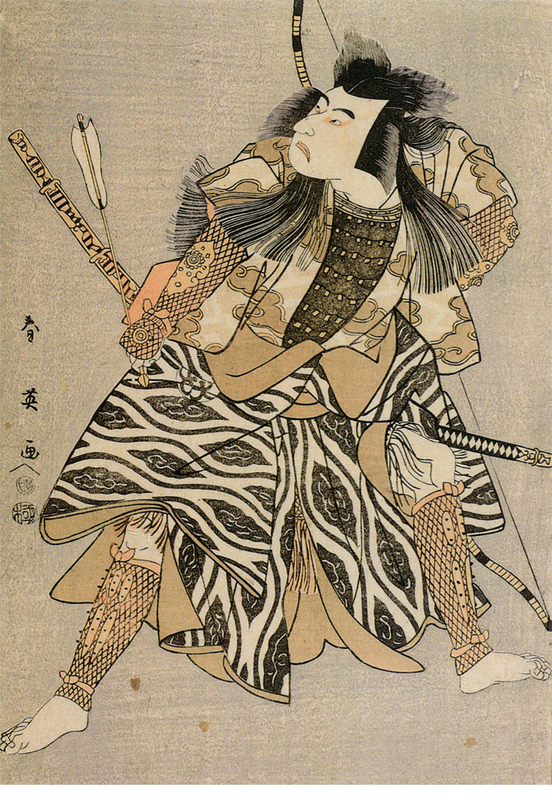 The third archer is in the ukiyo-e style, suggesting a Japanese source. 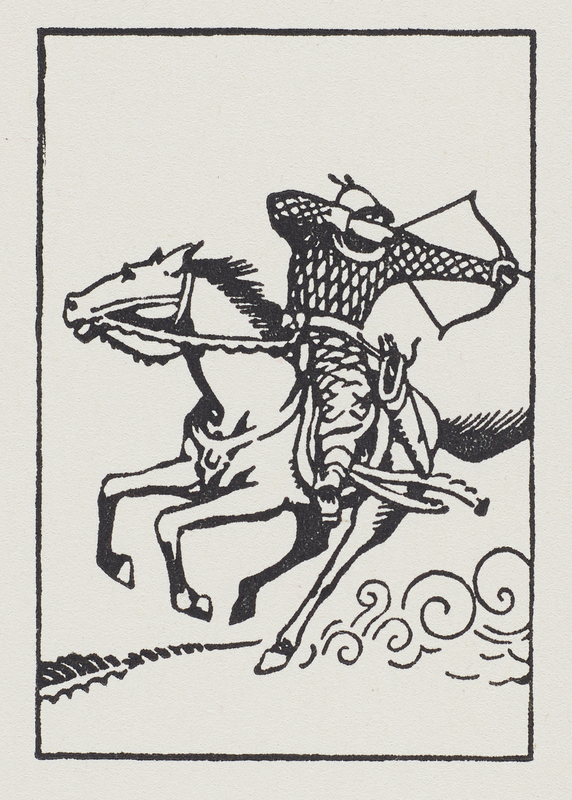 The archer on horseback is unusual in that Dwiggins’ illustrations rarely have that much sense of movement. Perhaps it is derived from a Chinese painting. None of these archer illustrations has a precedent in previously illustrated editions of Marco Polo’s travels. The Travels of Marco Polo (Rochester, New York: The Printing House of Leo Hart, 1933), p. 72. Marginal illustration by W.A. Dwiggins. Greatly enlarged. The Travels of Marco Polo (Rochester, New York: The Printing House of Leo Hart, 1933), p. 112. Marginal illustration by W.A. Dwiggins. Greatly enlarged. The Travels of Marco Polo (Rochester, New York: The Printing House of Leo Hart, 1933), p. 310. Marginal illustration by W.A. Dwiggins. Greatly enlarged. 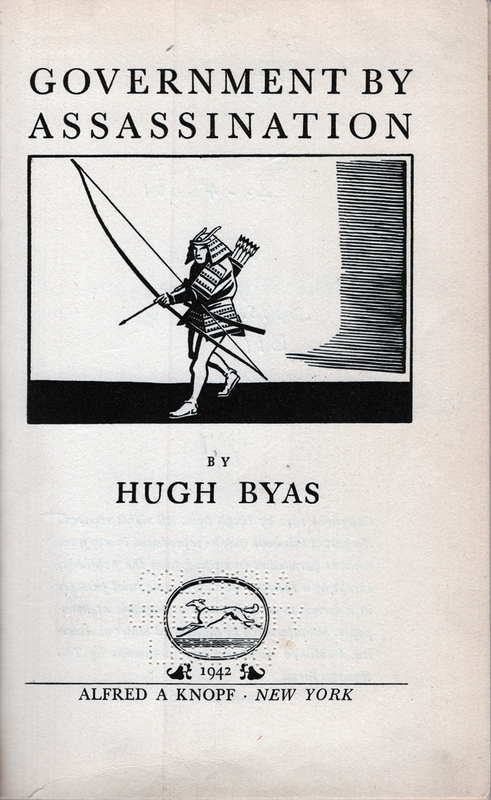 Title page of Government by Assassination by Hugh Byas (New York: Alfred A. Knopf, 1942). Illustration and typography by W.A. Dwiggins. Detail of reproduction of Japanese painting from W.A. Dwiggins reference file. Courtesy of Special Collections, Boston Public Library. 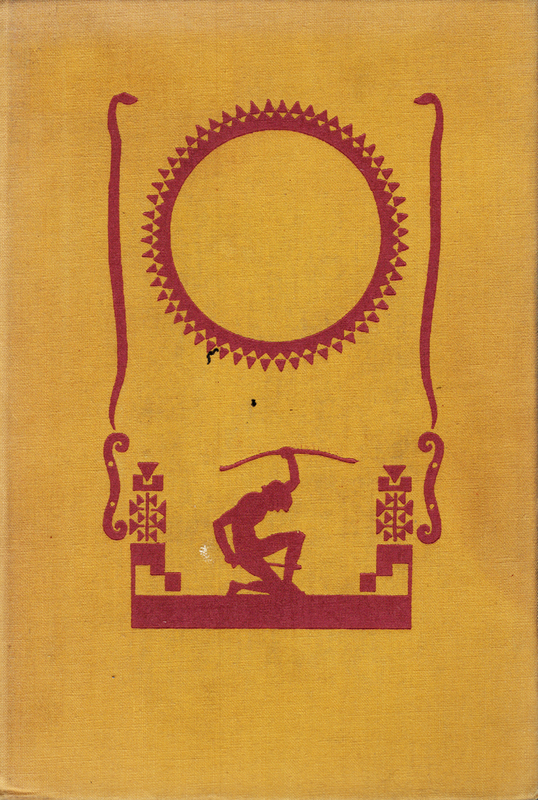 It was inevitable that Dwiggins created an archer for Arrows into the Sun by Jonreed Lauritzen (New York: Alfred A. Knopf, 1943). For the binding side design he drew an archer in silhouette, kneeling with arrow in one hand and upraised bow in the other. The archer is flanked by ornaments and serpents with a decorative sun above him—all stamped in dark red on dark yellow cloth. There is no archer inside the book. Binding side for Arrows into the Sun by Jonreed Lauritzen (New York: Alfred A. Knopf, 1943). Design by W.A. Dwiggins. For The History of Susanna: From the Apocrypha of the Hebrew Bible according to the King James Version (New York: The Scribe, Archway Books, 1947), Dwiggins created a series of ancient friezes running below each illustration of a “modern” Susanna being judged by the elders. The friezes are in the style of Assyrian bas reliefs but are not direct copies. The one on p. 33 shows an upright archer shooting a lion standing on his hind legs. The lion is based on one that appears on the seal of King Darius the Great but the rest of the scene has been concocted by Dwiggins. The History of Susanna, as with all five of the books in The Scribe series, is entirely written out by hand. Page 33 from The History of Susanna (New York: The Scribe, Archway Press, 1948). Design and illustration by W.A. Dwiggiins. The last archer designed by Dwiggins was for the binding side and title page of A Crossbowman’s Story of the First Exploration of the Amazon by George Millar (New York: Alfred A. Knopf, 1955), published a year before his death. 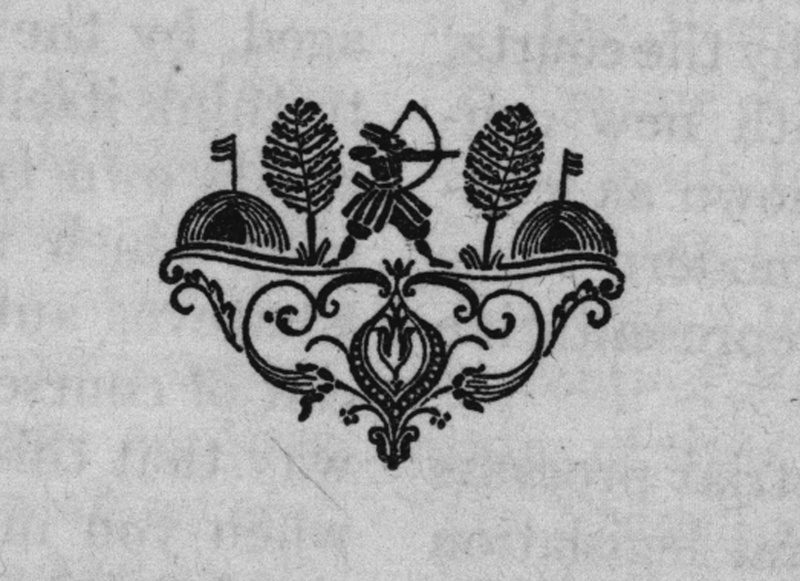 The advancing crossbowman is drawn in simplified, woodcut style with minimal detail. He is flanked by the initials of the author, a common Dwiggins binding idea. The design is blind stamped on ruby red cloth. The same crossbowman, with a touch more detail, is reproduced on the title page as part of a scene with an Indian in a canoe on the Amazon River. 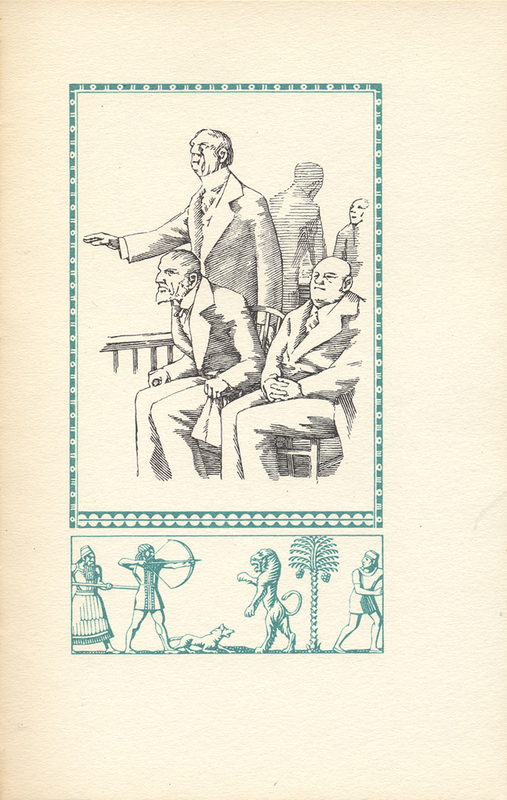 Below the title Dwiggins has added a primitively drawn scene of the Spanish conquistadors meeting the Amazonian Indians. But none of the figures are archers. Artwork for binding side design for A Crossbowman’s Story of the First Exploration of the Amazon by George Millar (New York: Alfred A. Knopf, 1955). Design by W.A. Dwiggins. Courtesy of Vincent Torre. 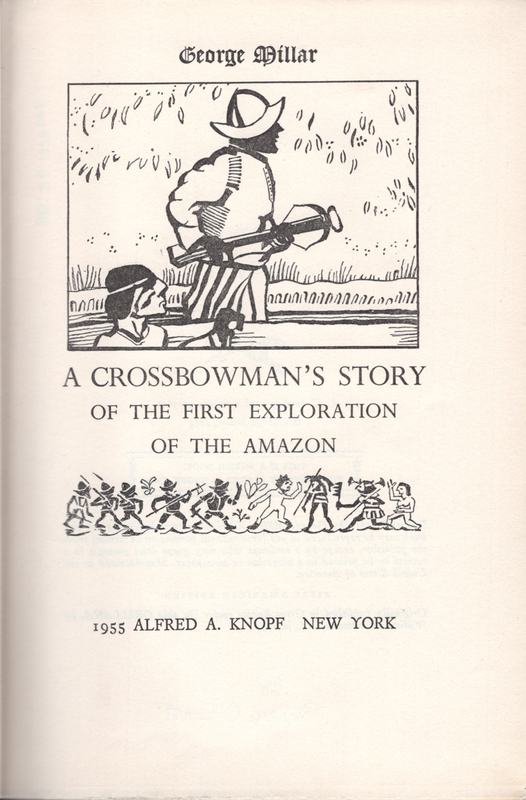 Title page of A Crossbowman’s Story of the First Exploration of the Amazon by George Millar (New York: Alfred A. Knopf, 1955). Illustration and typography by W.A. Dwiggins. 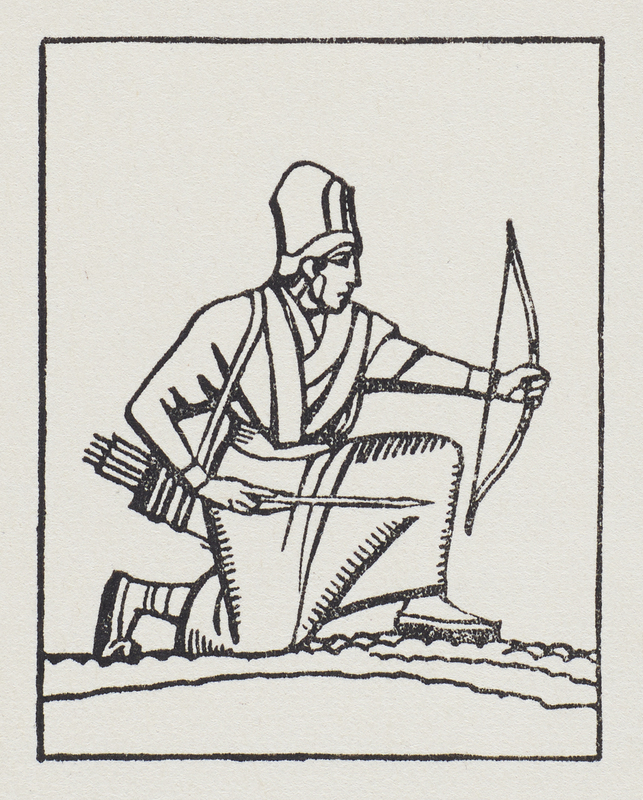 The archer is a recurring figure in Dwiggins’ oeuvre over the course of roughly seventy years for several reasons. On one level, Dwiggins was simply fascinated by the figure and the number of variations he could create based on different historical sources. The archer was a romantic figure from a time before the modern mechanical age, whether that time was ancient Assyria or England in the Middle Ages. Sometimes the archer had a direct connection to the content of the project Dwiggins was working on, but most of the time the archer was added to a design for purely personal reasons. 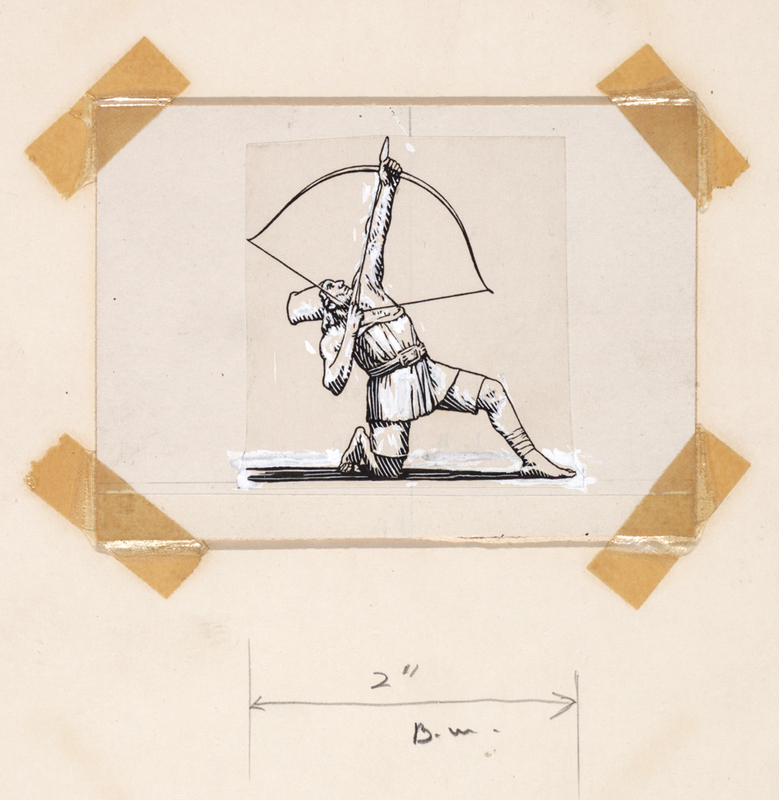 When the projects were private the archer took on a symbolic role, representing Dwiggins’ aspirations. 1. See the loose sheet (EF) from Moses Dwiggins’ ledger in Folder 1, Box 34, 1974 W.A. Dwiggins Collection, Boston Public Library. 2. See A Bibliographical Check-List of Christmas Books by Walter Klinefelter (Portland, Maine: The Southworth-Anthoensen Press, 1937), p. 53. Klinefelter says possibly 500 copies of the book were printed by The Heintzemann Press in 1914 another 200 copies in 1915 as a Christmas gift book by Brad Stephens and Company and The Heintzemann Press. He makes no mention of Dwiggins’ involvement in the book. Although little is known about Stephens, he was one of the key figures in Dwiggins’ career, especially during the years 1912 to 1927. 3. This drawing on the cover of a Kisogawa Paper swatchbook from the Japan Paper Co. is not fully verified. 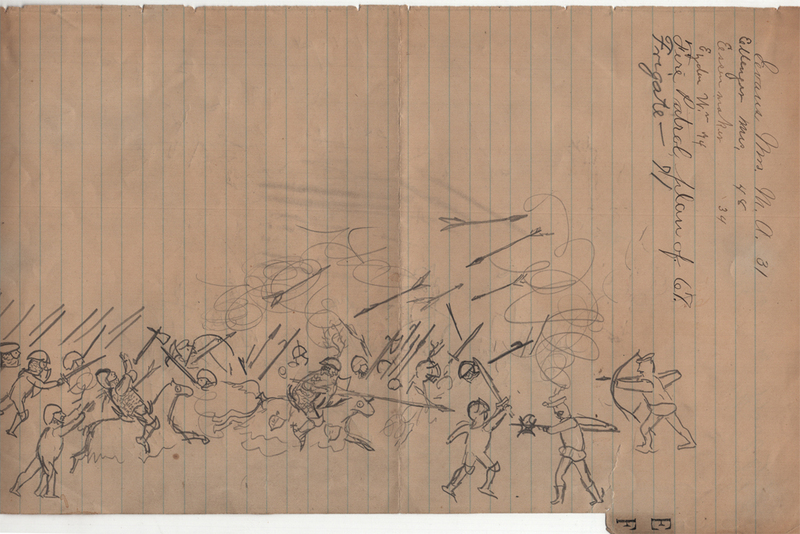 I think it is the job referenced in the entry for October 1, 1915 in Dwiggins’ account book which reads: “sketch for title page to Fairbanks Japan Paper”. See Folder 3, Box 81(1), 1974 W.A. Dwiggins Collection, Boston Public Library. 4. Laurance B. Siegfried was a frequent collaborator of Dwiggins’ between 1913 and 1921. He worked for Brad Stephens and Co. from 1914 to 1917. See the typescript autobiography (c. 1948) in the George Arents Archives, Syracuse University Library. 5. The peculiar part of the kneeling archer’s attire is his chef-like hat which does not seem to match any headgear used in Ancient societies, though Dwiggins may have been intending it to appear Egyptian. 6. For the original artwork see Folder 10, Box 58, Ms Collection 392 Ronald Peters Collection, Thomas Fisher Rare Book Library, University of Toronto. 7. Quote from letter from Dorothy Abbe to John Kristensen 11 March 1987 in Folder 20, Box 9, 2001 W.A. Dwiggins Collection, Boston Public Library. 8. Dwiggins’ copy of A Manual of Historic Ornament is in Box 106, 1974 W.A. Dwiggins Collection, Boston Public Library. Plate 3 Assyrian Ornament has the wall carving sketched in reverse at the top. Plaster copies of the British Museum Assyrian carvings were made for the Museum of Fine Arts, Boston in the late 19th century. See Museum of Fine Arts Boston: Catalogue of Casts Part I: The Egyptian Casts by Charles D. Loring and Catalogue of Casts part II: Chaldean and Assyrian Sculpture by Edward Robinson (Boston and New York: Houghton, Mifflin and Company, 1891), p. 38. The MFA acquired photographs of the Assyrian reliefs in the British Museum in 1919. 9. Dwiggins owned a copy of Styles of Ornament published by B.T. Batsford in 1910 according to my notes from the 1990s, but I did not record where the book is located in the Dwiggins Collections at the Boston Public Library. 10. For November Dwiggins illustrated a man standing with a violin case under his right arm and for December he drew what appears to be an Indian deity. 11. See Life magazine 22 July 1940, p. 51. Dwiggins’ copy of the page is in Folder 14, Box 39(3), 1974 W.A. Dwiggins Collection, Boston Public Library.